The US must stop talking about sending the next wave of troops to Afghanistan, and tackle the country's dependence on illicit opium instead. After fighting the longest war in its history, the United States stands at the brink of defeat in Afghanistan. How can this be possible? How could the world’s sole superpower have battled continuously for 15 years, deploying 100,000 of its finest troops, sacrificing the lives of 2,200 of those soldiers, spending more than a trillion dollars on its military operations, lavishing a record hundred billion more on “nation-building” and “reconstruction,” helping raise, fund, equip, and train an army of 350,000 Afghan allies, and still not be able to pacify one of the world’s most impoverished nations? So dismal is the prospect for stability in Afghanistan in 2016 that the Obama White House has recently cancelled a planned further withdrawal of its forces and will leave an estimated 10,000 troops in the country indefinitely. After seizing Kabul in 1996 and taking control of much of the country, the Taliban regime encouraged local opium cultivation, offering government protection to the export trade and collecting much needed taxes on both the opium produced and the heroin manufactured from it. U.N. opium surveys showed that, during their first three years in power, the Taliban raised the country’s opium crop to 4,600 tons, or 75 percent percent of world production at that moment. In July 2000, however, as a devastating drought entered its second year and mass starvation spread across Afghanistan, the Taliban government suddenly ordered a ban on all opium cultivation in an apparent appeal for international recognition and aid. A subsequent U.N. crop survey of 10,030 villages found that this prohibition had reduced the harvest by 94 percent to a mere 185 tons. To an extent not generally appreciated, for the previous two decades Afghanistan had devoted a growing share of its resources — capital, land, water, and labor — to the production of opium and heroin. By the time the Taliban outlawed cultivation, the country had become, agriculturally, little more than an opium monocrop. The drug trade accounted for most of its tax revenues, almost all its export income, and much of its employment. In this context, opium eradication proved to be an act of economic suicide that brought an already weakened society to the brink of collapse. Indeed, a 2001 U.N. survey found that the ban had “resulted in a severe loss of income for an estimated 3.3 million people,” 15 percent of the population, including 80,000 farmers, 480,000 itinerant laborers, and their millions of dependents. 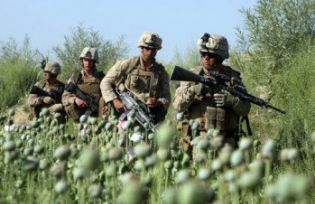 The U.N.’s Afghanistan Opium Survey 2007 found that the annual harvest was up 24 percent to a record 8,200 tons, which translated into 53 percent of the country’s GDP and 93 percent of the world’s illicit heroin supply. Significantly, the U.N. stated that Taliban guerrillas had “started to extract from the drug economy resources for arms, logistics, and militia pay.” A study for the U.S. Institute of Peace concluded that, by 2008, the movement had 50 heroin labs in its territory and controlled 98 percent of the country’s poppy fields. That year, it reportedly collected $425 million in “taxes” levied on opium traffic, and with every harvest, it gained the necessary funds to recruit a new crop of young fighters from the villages. Each of those prospective guerrillas could count on monthly payments of $300, far above the wages they would have made as agricultural laborers. Not surprisingly, the strongest attacks came in the poppy heartland of Helmand Province, where half the country’s opium crop was then grown and, said the New York Times, “the lucrative opium trade made it crucial to the insurgents’ economic designs.” By mid-December, after overrunning checkpoints, winning back much of the province, and setting government security forces back on their heels, the guerrillas came close to capturing that heart of the heroin trade, Marja, the very site of President Obama’s media-saturated surge rollout in 2010. Had U.S. Special Operations forces and the U.S. Air Force not intervened to relieve “demoralized” Afghan forces, the town and the province would undoubtedly have fallen. By early 2016, 14-plus years after Afghanistan was “liberated” by a U.S. invasion, and in a significant reversal of Obama administration drawdown policies, the U.S. was reportedly dispatching ”hundreds” of new U.S. troops in a mini-surge into Helmand Province to shore up the government’s faltering forces and deny the insurgents the “economic prize” of the world’s most productive poppy fields. Simultaneously, a recent U.N. Security Council investigation found that the Taliban has systematically tapped “into the supply chain at each stage of the narcotics trade,” collecting a 10 percent user tax on opium cultivation in Helmand, fighting for control of heroin laboratories, and acting as “the major guarantors for the trafficking of raw opium and heroin out of Afghanistan.” No longer simply taxing the traffic, the Taliban is now so deeply and directly involved that, adds the Times, it “has become difficult to distinguish the group from a dedicated drug cartel.” Whatever the long-term trends might be, for the foreseeable future opium remains deeply entangled with the rural economy, the Taliban insurgency, and government corruption whose sum is the Afghan conundrum.